5 grams of top shelf flower and 1 gram of premium live resin! It starts with hand-selected flower based on terpene profile, taste, structure, and appearance, and is paired with top shelf concentrate, creating unique flavor profiles for each batch with the connoisseur smoker in mind. When flower enters our facility, it is evaluated, and put through a Humidity Treatment to prep for rolling. We have two walk-in humidors for production and curing. 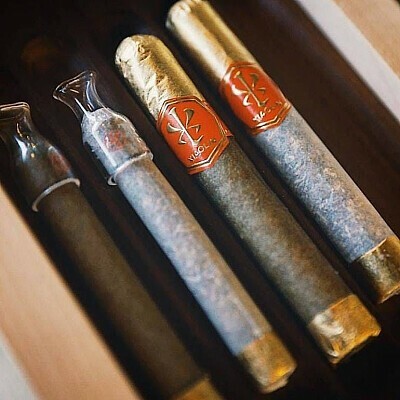 Our team of creative rollers hand-infuse flower, and then roll cannagars into a variety of wraps.